Incline 0 to 20 degrees of adjustable, manual incline levels. The NordicTrack E 7.0 Z elliptical is one that comes packed with a vast array of features that allows buyers to customize their workouts as per their needs. With an adjustable stride length and a good number of pre-installed workouts, this machine is known to provide the quality promised by NordicTrack. The inclinable ramp and 20 different resistance levels allow you to focus attention on specific muscle groups and get most out of your workouts. 0 to 20 degrees of adjustable, manual incline levels. 20 interchangeable resistance levels for higher customization. 18″ to 20″ adjustable inch stride length with large foot pedals to train specific areas of the body. Smart console with iFit compatibility that gives access to an extensive workout library and allows better health progress tracking. Tablet holder with USB charger. Smooth and quiet operation due to “inertia-enhanced” flywheel. A comparatively light-weight flywheel, even though it delivers smooth performance. Low tension levels compared to other machines in the same price range. 18″ – 20″ adjustable stride length. Inertia-enhanced flywheel for smooth and quiet performance. Dual grip sensors to monitor heart rate. 5″ backlit display with iFit Compatibility. Lifetime warranty on frames and one year with parts and labor. Tablet and Water bottle holder. The stride motion on this unit is reported to be very smooth and to have a “natural” feel to it. The adjustable stride length makes it convenient for users from any height group to get the best out of a workout. The performance of this machine is something most buyers can vouch for, but there are some who get unlucky with their lot. Something that is worth mentioning is that there are occasional complaints about it being wobbly – which could be due to defects with some of the shipped units, improper assembly or even due to the weight of the users. Some unlucky buyers have received damaged components after shipping, which obviously impacted the performance of the machine. The NordicTrack E 7.0 Elliptical trainer has a sturdy build quality and most features work as advertised by the company. This unit can hold weights up to 300 lbs which give heavy-weight users a tension-free threshold. The lifetime frame warranty adds further security for customers. One critical point here is that the ramp incline is manual – not automatic or electric as promoted in some places. Therefore, it would take someone who can easily lift 30 lbs to make changes to it. Putting this machine together might not be a one-person job unless you are familiar with assembling a lot of fitness equipment. It takes a bit of space to lay out all the parts provided and a decent amount of time to completely set up. On average, it takes two people around 1.5 to 2 hours to complete assembly. 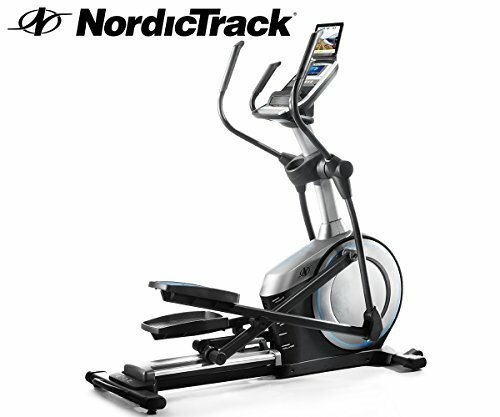 You can expect to be presently satisfied with the NordicTrack E 7.0 Z if you do decide to buy. Built by a well-established brand in the elliptical market, it provides all the essentials and more for the $800 price range. Something worth mentioning is that this is not the only one that does so and that other brands do provide similar value within the same price range. Nonetheless, this reliable machine from NordicTrack packs a great punch for the price and usually does not disappoint. Diet or Exercise: What Comes First?